Welcome back. Thanks for subscribing. Situational awareness: President Trump slapped tariffs on another $200 billion of Chinese imports. And he threatened to more than double that if Beijing retaliates. Why it matters: Earlier this month, we reported that the impact of artificial intelligence is happening only slowly, but will pick up to a rapid clip in the late 2020s. But with automation, we are already there, according to a report by the Geneva-based World Economic Forum. Examining large companies in 20 advanced and developing economies, the report said that by 2022, machines will carry out 42% of the labor — and an accelerated 52% just three years later. That's up from a 29% automated share last year. The people, employers and governments in these countries have barely begun planning the fundamental reordering of work, education and society needed to absorb this coming new blow to the global system. The findings align generally with a slew of reports released the last two years by Western think tanks and companies. "Mass redeployment in labor forces around the world, including reskilling/retraining (rather than mass unemployment), is one of the societal grand challenges in the next several decades," said Michael Chui, who has led numerous automation studies for the McKinsey Global Institute. In the U.S., there is only embryonic discussion underway. In an event today, President Trump spoke at the inaugural meeting of his National Council for the American Worker, which he established in July to begin planning how to retrain workers for the future economy. Meanwhile automation is already happening fast — 75 million workers could lose their jobs to automation by 2022, the World Economic Forum report said. If those workers are given "significant" reskilling, and a pipeline of new workers is created in schools and colleges, companies could create 133 million new jobs by 2022 — more than compensating for those that vanish, the report says. By "significant," the report means an average of 101 days of retraining, a little over three months. But the operative phrase is "if," says Saadia Zahidi, the study's lead author and head of the forum's Center for New Economy and Society. The future job forecast is based on a conceptual idea of new skills that, if learned by a single person, could result in a new occupation. If such skills are compounded out, the economy could have a slew of new emerging occupations. "But they won't emerge if we don't give people the right skills," Zahidi said. The bottom line: A primary finding is that every part of the work chain — labor, companies and government — will have to step up to head off a dangerous disruption. For workers, this is because two-thirds of the companies said they would provide retraining only for their highest-skill talent, Zahidi said. That will leave the rest of the workforce on its own. One reason: No company has the money to reskill all its vulnerable workers, Zahidi said. An option, in addition to the government stepping in, is for companies to pool their resources for reskilling "if competitive factors can be put aside," she said. Early shudders of AI-driven automation are already palpable in the job market, with work that requires a human touch flourishing and routine jobs slipping away, according to data from LinkedIn. 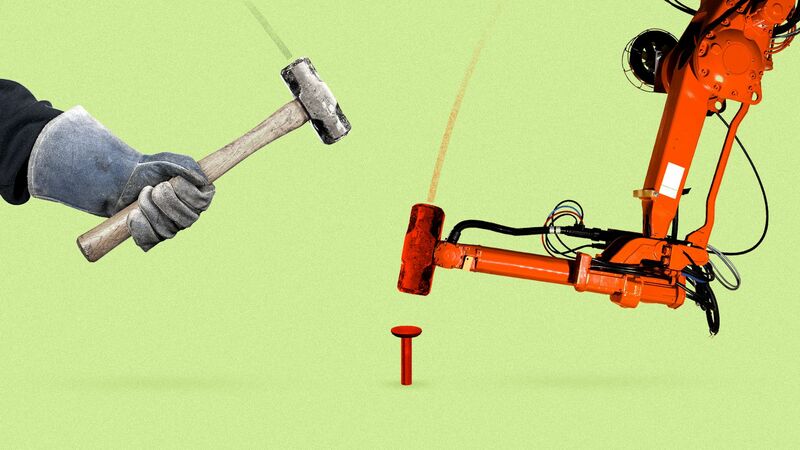 Why it matters: With significant upheaval still years down the road, this is the time to prepare for the AI revolution, as discussed above, Axios' Kaveh Waddell reports. The details: To determine how demand has changed over the past five years, LinkedIn examined its trove of data on jobs and job seekers, comparing hiring by profession with all its job postings. The chart above shows the average annual change for the fastest-moving fields. The outcome is as experts have long predicted. LinkedIn found that jobs requiring interpersonal skills (HR workers, recruiters, and real estate agents) are growing, while jobs relying on skills that can be automated (administrative assistants, accountants, customer-service reps) are shrinking. But, but, but: Not all the job shrinkage was due to automation. Journalists and editors — alas! — are on the out-and-out not because their jobs are being taken by robots (yet), but because the news business as a whole has not landed on a lucrative financial model in the internet age. Dismantle an Amazon Echo and you’ll find little more than speakers, microphones, several circuit boards and some fiddly plastic bits. But zoom out — all the way out — and you’ll find something that separates this technology from almost any other. Why it matters: There’s an odd two-way relationship between Echo owner and Amazon in which each effectively works for the other — but in the long run, the company comes out ahead, Kaveh reports. That’s according to a pair of academic researchers. New York University’s Kate Crawford and University of Novi Sad's Vladan Joler last week published a long essay and schematic centered on the voice assistant. Like previous technology, they write, the Echo relies on long supply chains through dodgy countries with abusive labor conditions. But the Echo's use of artificial intelligence adds a different twist, as it subsists on huge amounts of personal data: photos, videos, voice, text communication. When consumers use their Echos, they are doing unpaid work for Amazon, because their voice commands and feedback are sent back to its servers to help train its AI. Amazon is able to sell more Echos, and to upgrade them, because of this data sent back by users. This dynamic exists for every system that uses AI algorithms to interact, whether social-media platform or smart speaker. And the biggest winners are the companies. "In the dynamic of dataset collection through platforms like Facebook, users are feeding and training the neural networks with behavioral data, voice, tagged pictures, and videos or medical data. In an era of extractivism, the real value of that data is controlled and exploited by the very few at the top of the pyramid." The big picture: Like detectives stringing red yarn between Polaroids, Crawford and Joler draw a line from Amazon CEO Jeff Bezos, the richest man on Earth, all the way to the child laborers who extract metals from Congolese mines for his company’s products. It would take one of these children 700,000 years of nonstop work to earn as much as Bezos does in a single day, the authors write. And the materials they mine — after being refined, assembled, shipped and sold — are returned to the Earth once the Echo is used and then thrown out, landfilled or incinerated after valuable materials are stripped out for reuse. "Put simply: each small moment of convenience — be it answering a question, turning on a light, or playing a song — requires a vast planetary network, fueled by the extraction of non-renewable materials, labor, and data." Expect these devices and the assistants they house to keep proliferating. CNBC reported today that Amazon is planning eight new Alexa-powered devices, including a microwave oven. A marketing stunt in Russia kicked off a minor rush to tattoo parlors when Domino’s Pizza promised 100 years of free pies to anyone who permanently inscribed themselves with the company's logo, Kaveh reports. The big picture: A local franchise found that it needs to be much more careful in its offers of free food, write WSJ's James Marson and Thomas Grove. The details: The promotion by a Domino’s franchise in Russia received more responses in just a few days than were expected over the course of months. The promotion: Anyone willing to plaster the Domino's logo on their bodies would receive 100 free pizzas a year, for 100 years. To lock down the prize, an inky pizza-lover needed only a social media post showing off the tat. Four days after announcing the campaign, Domino’s pulled the plug. Already, 381 people had qualified. There are reasons why this seemingly outrageous promotion could cause such a ruckus, write Marson and Grove. Memories of hungry Soviet times and a bad 1990s economy prime Russians to seek out particularly juicy deals, they write. The economy isn’t doing that well right now, either, with the average disposable income hovering around $500 a month. An invasion of American culture has helped turn tattoos from a mark of criminality to a symbol to be sported by trendy hipsters.